Cambridge Audio Alva TT review | What Hi-Fi? Cambridge Audio's first turntable in absolutely ages is no ordinary turntable. The £1500 Alva TT offers features and functionality that are rare at the price, including a built-in phono stage, direct drive and Bluetooth connectivity. Bluetooth turntables have become decidedly fashionable of late, picking up popularity on the back of the vinyl revival. It sounds like an awkward marriage of old and new technology, but it’s undeniably convenient. Rather than investing in a full hi-fi system, all you need is a turntable and a Bluetooth speaker or wireless headphones. You can then submerge yourself in the warm fuzzy glow of vinyl. But the Cambridge Audio Alva TT doesn’t just feature ordinary Bluetooth. It’s the only deck at the time of writing to offer aptX HD Bluetooth support. That means you can stream your vinyl to compatible wireless products in hi-res 24-bit/48kHz. The Cambridge Audio Alva TT certainly has the looks and presence of a £1500 record player. Named after Thomas Alva Edison, inventor of the phonograph (the first turntable), the deck has a solid piece of aluminium as its top plate, which is silky smooth to the touch. We’re big fans of the gun metal and smoky grey finish: it gives the Alva TT an elegant but purposeful appearance. Although the Alva TT isn’t strictly a member of Cambridge’s Edge range of high-end hi-fi electronics, the styling is a close match and it certainly wouldn’t look out of place next to them. There’s even a nod to that range in the Alva’s design. The knurling on the heads of the fitting screws is similar to that found on the edge of the volume control for the excellent Edge NQ streaming preamp. The Alva TT is a direct drive design. That’s unusual at this price point, but it promises a number of improvements over belt-driven designs, including speed stability and accuracy. The Polyoxymethylene platter (a material chosen for its rigidity and density) is spun using a medium torque motor to aid smoothness of motion. It’s powered by an internal power supply. 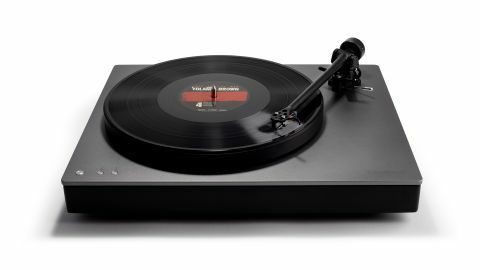 The deck comes with a Rega-sourced tonearm and high output moving coil cartridge. The arm is fixed, while the phono stage (based on the five-star Duo) is built-in. There’s no option to bypass it, but given the market the Alva is aimed at, we doubt this will be a deal-breaker. Helpfully, the analogue output on the rear of the record player is labelled upside down so you can read it when peering over the back. It’s also where the Bluetooth pairing button is located. The labelling for this is the other way around, which ironically makes it trickier to read. For wireless listening, press the pairing button and hold for a couple of seconds to kick things off. The LED lights up once it’s paired to your device, and flashes when it’s connected to a device with aptX or aptX HD. It takes a few seconds for our headphones to pair and we found that the process works better if you place them relatively close to the deck while pairing. The deck can play at 33⅓ and 45rpm speeds – the small circular power and control buttons can be found on top of the unit, in the lower left hand corner. From cold, the Alva TT sounds a little congested so we’d recommend a few days of solid running in before you embark on any major listening sessions. Once firing on all cylinders, the whole soundstage opens up dramatically. There’s a sense of openness and clarity there, which allows for plenty of space around instruments and vocals. The way the Cambridge handles the midrange is particularly impressive. We play Never Tear Us Apart from INXS’s timeless Kick album, and the definition and detail in Michael Hutchence’s vocal is superb. It doesn’t apologise for projecting and positioning it centre stage, and nor should it. The brief saxophone solo sounds tight and beautifully defined, which is another string to the Alva TT’s bow, while there’s precision and tightness across the frequency range. The Alva serves up a weighty helping of bass, but also plenty of texture and definition here, too - it's a grown up, mature sound. Switch track to the funky New Sensation and the Alva continues to shine. The only thing that’s missing is the get-up-and-go of similarly-priced rivals, such as the Rega Planar 6/Ania (£1469). The Rega doesn’t have the same array of features as the Cambridge, but in pure sonic terms it has the edge. Where the Cambridge Audio Alva TT seems quite hesitant to let rip, the Rega displays greater freedom of movement. It’s a comparative lack of dynamism and drive from the Cambridge, and it can leave you feeling a little disconnected from the music. It’s much harder to nail the Bluetooth performance of the Cambridge. The feature works well, but your music only sounds as good as your headphones or speakers allow it to. A poor-sounding pair of aptX HD Bluetooth headphones could sound worse than a good pair with standard Bluetooth support. With the Alva TT, Cambridge Audio has managed to put an interesting spin on a premium turntable. It’s a brave and bold move that, on the whole, has paid off. Not everyone has space for lots of boxes in their audio system, and achieving the same sort of set-up from a traditional deck could mean a lot more hassle. The Alva TT might not be the final word in sound quality, but it’s still a good-looking, smart product that has plenty going for it.